Students presenting “Literacy: the Cornerstone of Success” at the Greenville Public Library are Lindsay Schultz, Julia Mellott, Abigail Bond, Amanda Schiflit, Drew Monnin and Paige Burns. Photos courtesy of Rachel Brock, Greenville Public Library. 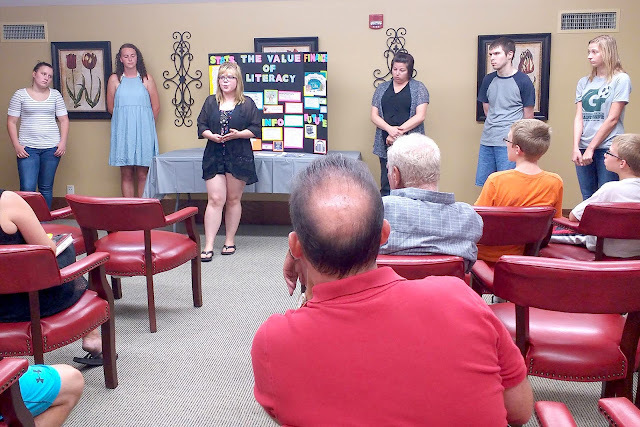 Communications students at the Edison State Community College Darke County Campus expanded their community service outreach recently with a public presentation on “Literacy: the Cornerstone of Success” at the Greenville Public Library. During the presentation, students discussed the challenges of illiteracy. “Among developed nations, the United States ranks 16th in literacy,” Edison State students told the audience. They also noted that 12 percent of adults in this country are considered illiterate, unable to read beyond the sixth grade level. With more and more lower level jobs moving to automation, high school dropouts – sometimes even those with only high school diplomas – will have more difficulty obtaining employment that pays enough to support a family. A byproduct of illiteracy is crime and poverty, the students added. From their research, about two-thirds of students unable to read past a fourth grade level are likely to end up in prison or on welfare. The Edison State students wrapped up their presentation by talking about the resources that are available to help students in Darke County, including local school districts, Empowering Darke County Youth, We Are the Majority, Big Brothers Big Sisters, and more. Edison State Darke County Campus Executive Dean Chad Beanblossom attended the presentation and commended the students for the quality and value of the information provided to the community. Edison State Darke County communications students have been giving presentations on Bullying and Drug Abuse at local school districts for several years. Districts that have invited them in the past include Arcanum, Mississinawa Valley, Ansonia, and Greenville. They also participate in tutoring and mentoring programs such as Empowering Darke County Youth and Big Brothers Big Sisters of Darke County. This is the first time they have taken on the topic of literacy and presented it in a public forum. Edison State students have been invited back in the fall for a public presentation on bullying. Beanblossom noted that students from the Darke County Campus have accumulated over 1,500 hours of service to the community during the 2016-2017 academic year. “These activities benefit the individual student, the campus, and the community overall,” he said.